..in a can, no less. After stopping by the bakery today and getting a five pound bag of bread (25 small breads), I and the other 'wege stopped by the supermarket to pik up more juice and see what else he might have. And there, among canned peas and coconut milk, was jam. In a can. 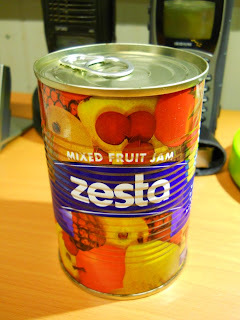 There is probably something funny to be said about that - cans of jam. It's a can - much like any other can - but full of jam. With a pull-top lid, no less. Mhmmm - sugary goodness. I don't even want to know what 'permitted food color and flavour' is, not why they mix US and the Queens Own spelling. This picture really don't do it justice... it don't show off the eye-popping red that greeted me as I peeled the lid off. A bit of jam, a piece of fresh bread... Looks like lunch to me.